The Harley Owners Group® (HOG) is an organisation founded and sponsored by Harley-Davidson® Motor Company. With more than one million members, it is the largest factory-sponsored motorcycle group in the world. It was established to offer motorcycling benefits and services to Harley-Davidson enthusiasts throughout the world, and to develop a close relationship between the Harley-Davidson rider, the Harley-Davidson dealer and Harley-Davidson Motor Company. The Rockhampton HOG Chapter 9116 was formed on the 28th of January 1995 with 18 members attending the meeting. From that 1st meeting, membership grew to 40 by year's end. In 1997 the Chapter introduced the current format of the Official Ride held on the 1st Sunday of the month and the Chapter Meeting held on the 3rd Saturday followed by a social night after the meeting has adjourned. So mark your Calendars Rocky HOG for the 1st Sunday and 3rd Saturday of the month. The Chapter has hosted the QLD State Rally on two previous occasions. Firstly in 1998 and then again in 2009 with 100's of bikes from all over Australia and New Zealand heading to Rockhampton for the weekend. We regularly return the favour by attending events held by other Chapters. On the local scene, the Chapter gets involved in raising much needed funds for local charities throughout the year by holding or supporting Poker Runs, Toy Rides, Wild Woman's Rides, etc. Every HOG Chapter is sponsored by a Harley-Davidson Dealership. From 1995 it was Fairways Motorcycles. In 2004 Geoff and Mary-Jane Trewin took over Fairways and in 2005 restructured the dealership into the current Rocky Harley-Davidson (RHD). All rides depart from, and monthly meetings are held at Rocky Harley-Davidson. Since 1995 the Rockhampton Harley Owners Group membership has grown from just 18 at the 1st ever meeting to a peak of over 150 members. Currently we are sitting around 128 active and financial members. It is not uncommon to have over 20+ bikes on an Official Ride. In 2009, just prior to holding the State Rally, the Rumble Inn was built at the back of RHD. This is the venue for the monthly meetings and is also open every Friday evening from 5pm to 10pm for Chapter members and their guests to come and socialise at the end of the working week. So if you're interested in joining the Chapter or just passing through drop in for a cold one with a great bunch of Rockhampton HOG members. So if you would like to ride your Harley with a group of like minded people who are just out to enjoy the experience of riding a Harley-Davidson, then drop into Rocky Harley-Davidson (RHD) and one of the helpful staff will take care of you. • There will be a briefing before all rides so arrive half an hour before departure time. • Pay attention to the ride briefing given by the Road Captain. If in doubt - Ask. • If you are experiencing any difficulty that might affect others, let the Road Captain know before departure. • Always fuel up before the start of the ride. • Make sure your bike is in roadworthy condition. Check before you leave home, not 5 minutes before the ride time. Check all lights, battery, tyres, etc. • As a general rule, the group will depart and arrive as a group. Members wishing to take advantage of a clear highway will discuss their plans with the Road Captain before departure, and agree when they will leave and rejoin the main group. • Unless arranged prior to departure, do not pass the Road Captain. • Use only one lane of a multilane highway. Follow the lead of the Road Captain as to which lane to use. • Ride in a staggered formation except on narrow roads where you should follow in Indian or single file. When a rider leaves the group (e.g. : turning off to go home), or changes position in the formation, the remaining group will switch lanes using indicators to signal intention, and restore the staggered formation. 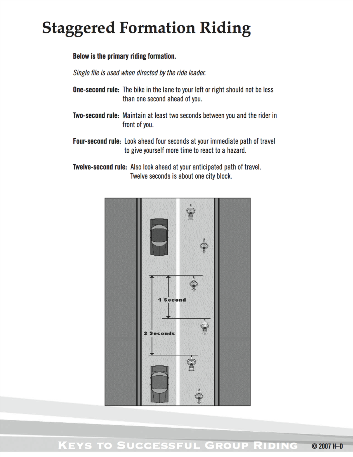 • When overtaking, maintain your overtaking speed until you are sure those overtaking with you have enough room to pull in behind without having to break suddenly. • If you intend to travel at a slower pace than expected on the ride, position yourself towards the rear of the group, and not in front or the middle. • New riders should take up position in front of "Tail End Charlie" for the first few rides. This is at the rear of the Pack. • Keep an eye on the rider behind you. If they stop unexpectedly you stop and determine the problem before proceeding. The rider behind you is your responsibility. An exception to this rule is "Tail End Charlie" - there should be no one behind him. • And most importantly - "RIDE SAFE AND HAVE FUN"
Personal privacy and security of information are mutual concerns of H.O.G.®, its members and visitors to the Rockhampton Harley Owners Group Web site. This statement explains H.O.G.’s Internet policies and security measures relating to personal privacy and information security. The Rockhampton Harley Owners Group Chapter collects and stores the following information about you when you visit the Rockhampton Harley Owners Group Web site: the name of the domain from which you access the Internet (for example, aol.com, if you are connecting from an America Online account); the date and time you access the Web site; and the Internet address of the Web site from which you linked directly to our Web site. The Chapter uses this information to measure the number of visitors to the different sections of its site. This helps H.O.G. to make its Web site more responsive to its members and prospective members. Rockhampton Harley Owners Group © 2018. All Rights Reserved.